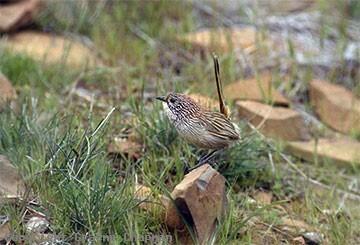 Short-tailed Grasswrens are restricted to the stony hilltops of the Flinders and Gawler Ranges in S.A. Only recently regarded as a species, they are very similar in appearance to the widespread Striated Grasswren, however research on the DNA suggests that the two may not be closely related. Currently two subspecies are recognised - A.m.merrotsyi throughout the Flinders Ranges and further west in the Gawler Ranges, A.m.pedleri. People used to go to Stokes Hill Lookout 15 km past the Wilpena turnoff on the road in to Flinders Ranges National Park to see this species, but in recent times because of drought and land use, they have been very difficult to locate there. 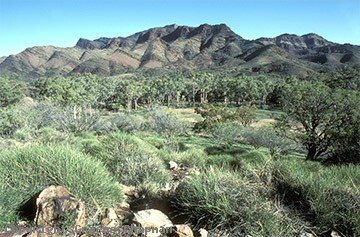 Elsewhere in the Flinders Ranges they are common where there is good spinifex country on the steep, rocky hills as far as Freeling Heights just north of Arkaroola. 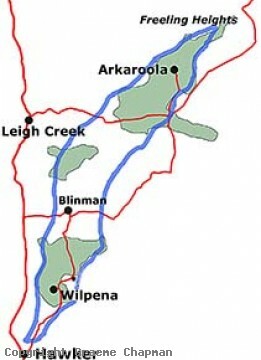 More recently, Lyn Pedler has found them also on high parts of the Gawler Ranges as far west as Mount Friday. 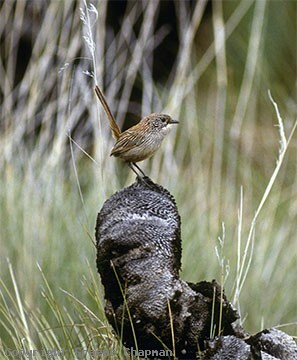 A good place to stay is Mt Ive Station (www.mtive.com) where both Short-tailed and Western Grasswrens occur. They have good facilities and miles of 4WD tracks to go birdwatching. 735201 ... Short-tailed Grasswren, Stokes Hill, S.A.
735202 ... Short-tailed Grasswren, Stokes Hill, S.A.
735203 ... Showing spinifex (foreground) and hilly terrain of habitat in Flinders Range S.A.
735204 ... Blue line indicates approximate range in Flinders ranges.